My policy is more than a robot tax, it eliminates the labor problems that arise from all automation, outsourcing, and the price gouging of necessities like healthcare. I propose reforming the corporate tax to include a multiplier that varies based on a business’s profit to labor ratio. Multiplying business tax rates by a P/L ratio has never been considered before but it is very simple. I developed this tax policy as a way to keep our capitalist system working, and to keep people working. It will indefinitely help subsidize any established or start-up company that is looking to expand in size and employment. My policy puts the burden on highly automated businesses and businesses that depend on foreign slave labor to find ways to contribute to the American economy and/or utilize displaced workers. While this tax will raise money for programs like the Universal Basic Income it will do more to improve labor standards and wages and reduce the need for the UBI. With this policy a business could reduce their tax rate by increasing their labor costs. Just as tax rates would increase for a business that increased profits by laying off workers. This insures that actual job creators are rewarded, and that businesses that don’t create enough jobs are given the decision to either pay a higher tax, increase labor costs, or reduce prices. Despite what some politicians say, capitalism isn’t perfect. The largest problem with our capitalist system is that profit and labor are in competition, which has led to a declining valuation of labor. My policy would remedy this natural problem. Every business person is aware that cutting labor costs is a great way to increase profits. Technology is making that easier every day. With driver-less cars, automated factories, robotics, and algorithms soon to replace so many workers we’re bound to see radically high unemployment soon. The drastically declining labor force participation is a clear sign of our labor market problems. We need a way to retrain an entire labor force and sustain their lives during this transition. My policy puts the burden on highly automated businesses and businesses that depend on foreign slave labor to find ways to contribute to the American economy and/or utilize displaced workers. This policy changes how automation, outsourcing, and inelastic demand of necessities affect labor and profits. To calculate their tax rate they would divide their profit by their labor costs and then multiply that by 27%. It works out so that a company with more than about $1.17 in profit to every $1 in labor would actually make more profit after tax if they increased labor costs, but if they reduced labor costs the increase in their tax rate would actually cause them to make less profit after tax. Some businesses may hire people for unnecessary jobs, like amenities for other employees, just to avoid taxes. Some businesses might choose to pay the higher tax, which would allow the government to afford any unemployment expense that might cause. Two important parts of the policy are that the first $100,000 in profit is tax free to protect small businesses, and only the first $200,000 of anyone’s salary is included in the P/L ratio to prevent extreme income inequality. These are examples of businesses that exist today. This shows how much of their profits in the given year would have to be spent to increase labor costs in order to optimize their after-tax earnings. Pay attention to the green bar. In these examples, you can assume that increasing their labor costs won’t earn them any extra sales/profit, although in many cases it would. What I imagine many companies will do is aim for a ratio around 1.7 and then pay large bonuses at the end of the year to drop them into the lower ratio and optimal tax rate. You’ll notice in example A how the first $100,000 in profit being tax free helps small business owners. Their P/L ratio is 3, which is far from the optimal ratio to maximize after tax earning. This small business owner would make the most after tax earnings if they increased their labor expenses by about $60,000. By doing so, they essentially pay nothing for this added labor and make an extra $45,000 in after tax earnings. In this case they only have to bring their ratio down to 1.5, unlike the largest corporations that optimize at around 1.17. Notice the optimal tax rate in example A is 40%, but that only applies to $140,248 of the $240,248 in profit. This business owner would only be paying a 23.7% tax rate. A business that only makes a $100,000, even without any employees, would pay no tax. The business in example B has a labor cost much higher than its profit. It wouldn’t benefit this company to increase their labor costs to reduce their tax burden. Although, even at this level if this company wanted to hire more people or pay higher wages it would still marginally reduce it’s tax rate. This will indefinitely help subsidize any established or start-up company that is looking to expand in size and employment. The businesses in examples C and D are similar. Example C has a one to one ratio; this company wouldn’t benefit from any additional labor expenses. Notice the tax rate for a balanced company is 27%, and in this example they effectively pay just 24.3% due to the first $100,000 being exempt. Now, example D is just over the optimal ratio. This company has slightly higher profits, but they’d only have to spend $13,681 to optimize their earning after tax. Notice their tax rate is still about 6% higher than example C even when optimized. Company D’s profits are noticeably higher too. This system allows for continual incentive for growth in profits, as long as labor rises in proportion. Examples E and F are similar. One company naturally has a larger labor expense, but both have the same amount of profit. The company with the larger labor expense won’t have to spend as much of their profits on labor to optimize their ratio. Example E has to nearly double their labor expense to optimize their ratio. Notice they both have a similar ratio in the end, but Business F has a higher optimal profit. 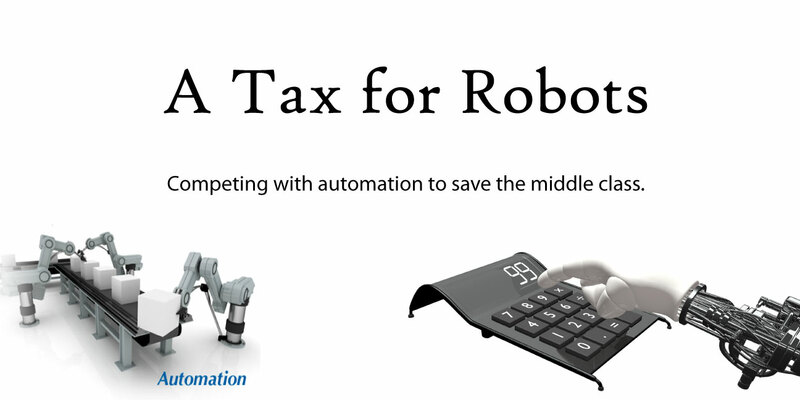 …my robot tax would allow for continual investments in labor and automation while also reducing consumer prices. If this policy is implemented it is going to allow us to reconsider some conservative economic policies. This policy will initially largely increase the volume of tax revenue collected by the government, and then the discussion about total tax reform can begin. With a larger and higher paid working class income tax rates can be reduced. A flat tax on non-food items is even possible. It’s possible that anyone making under $100k a year won’t have a federal income tax. That would eliminate income tax for roughly 93% of Americans. Wages will be high enough and prices low enough that the minimum wage won’t matter anymore. It eliminates the labor problems that arise from all automation, outsourcing, and the price gouging of necessities like healthcare. The biggest argument against privatization and reduction in federal jobs/spending has always been that the economy won’t naturally employ enough of the population or produce high enough wages, but this policy changes that. It also means that there will also be less need for social welfare programs. The need for labor laws and welfare programs has been steadily increasing since the invention of the motor engine. Welfare has been absolutely necessary to kept Americans alive who were outsourced by technology or cheaper foreign labor. Welfare even gives people time to transition to new industries. But welfare is not sustainable at current trends. The two current plans in Congress for the growing welfare expenses are to let the “losers” die, or to forever put their expenses on the national credit card until total socialism results. Having a large population of non-working people is bad for our culture, so is genocide of the poor. Having a large population of non-working people is bad for our culture, so is genocide of the poor. This policy even protects against outsourcing and reduces price inflation. It’s amazing it hasn’t been considered before. Not one economist I’ve spoken with had considered the idea, but it’s being widely supported. This policy is likely to be supported by both parties and the President. The need for this policy is becoming apparent to corporations; companies are preparing for a stagnating economy under the advisement of their own economists. My automation tax won’t change the Republican leadership’s plans, but it will prevent their plans from accidentally collapsing the economy. This is the missing piece of the republican economic policies, and one that Democrats will fully support. It’s the key to mending the growing divide. This is the missing piece of the republican economic policies and one that Democrats will fully support. Currently, when a business buys machines that replace laborers they reap all the benefits of the increased productivity. Many people would assume that the prices of the goods now being produced cheaply by machines would decrease, but they don’t drop as much as you’d think. 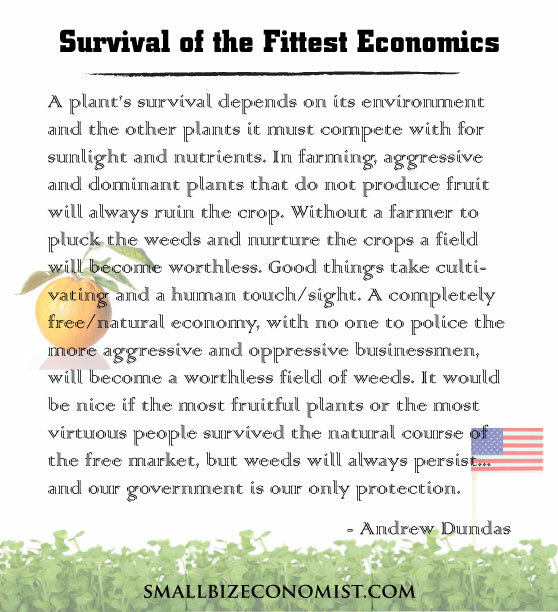 A non-disputed fact within economics is that the price of a good does not depend on the cost of production, but on what people are willing to pay for the good. Prices exist at the consumers’ value; labor costs have a greater impact on profit than price. A business that automates before others in the industry is unlikely to drop their price; they just get to reap the extra profits from the reduced labor costs. However, a business that automates first in an industry with inelastic demand would naturally choose to drastically drop prices just to increase market share and kill off some competition. With less competition, they can then charge a higher price and further maximize profits. This is how automation either inflates prices or profits at the expense of jobs and wages. The people who have been displaced by automation no longer have money to buy goods in the economy. These desperate unemployed people go looking for other work. They’re willing to take smaller wages. Less automated companies may either fire people to hire these lower wage workers, or they may negotiate down the wages of current employees. Companies that are late to automate have no choice but to put great pressure on their employees by forcing them to working longer hours and without raises, and their employees do it because they know there are displaced workers looking to replace them. Automation and technological unemployment drive down all wages, and this is why we realized we needed labor laws after industrial revolution during the Great Depression. There’s no doubt that we have labor and wage problems in America. For decades companies and farmers have been able to produce greater volumes of goods with less and less human labor expense. New kinds of jobs have appeared in our economy, but it takes time to transition. Without liberal policies that protect wages and the price of our most needed goods we wouldn’t have been able to make these transitions across the last 70 years. Without liberal policies that protect wages and the price of our most needed goods we wouldn’t have been able to make these transitions across the last 70 years. Soon, even some of the most technical jobs will be outsourced to a machine or technology. Economists at the World Economic Forum this year called it the fourth industrial revolution. As I’ve shown on this website, the genocide of human labor is slowly becoming seen in mainstream media coverage. It’s easy to dismiss and say that new jobs have always emerged, but the reality is that it took great use of government to stop the competition between machinery and labor from destroying the economy. As technology’s ability to replace jobs becomes greater we need greater government intervention. As technology’s ability to replace jobs becomes greater we need greater government intervention. We’ve come to a point that current wage and labor laws aren’t doing enough. It’s becoming clear that in a survival of the fittest economy, machines that don’t have rent, desires, or caloric needs, are the fittest for the job. The libertarian policies that conservative Republicans desire could accidentally reduce the world’s population by half across the next few decades. It appears that pure socialism may be the only way to stop the machine owners from siphoning up too much of the gains in productivity. Wealth has been increasingly stagnating at the top for decades. Policies have been leaning further right since Reagan, even during democratic presidents. Some have suggested returning to the progressive tax and labor policies on the 1950’s. Some promote a basic income “welfare” for all. Others suggest only moderate liberal policy changes. I developed this business tax variable as a way to keep our capitalist system working, and to keep people working. Over time, with this policy, people will work fewer hours for greater pay. This alone could solve so many of the problems Americans argue about like unemployment, under-employment, welfare, income inequality, immigration, minimum wage, maternity leave, middle class growth, national debt, Wall Street, oligarchy, outsourcing, middle class tax rates, etc. Are CEO’s pay considered part of labor? They aren’t. Executive salaries are not included in the labor expense. Also, the total labor expense of a company would only include salaries up to $200,000. Can a retailer/store count the labor that went into producing the good they sell? No, that has already been expended by the manufacturing company. The retailer can only consider their own labor costs. Would this increase the price of goods? There will be more positive than negative effects on prices. When wages rise generally so do prices. Under this system prices will be lower relative to the wage increases; primarily because this policy will reduce the largest cause of price inflation, income inequality. Historically, when wealth increases for only a small percent of the population, many companies chase the higher income earners by inflating prices. This leaves the middle class spending more of their income on goods and services. This system will greatly reduce income inequality, thus deflating prices. Also, a highly automated company, with a ratio over 2/1, that can’t find ways to employ enough workers to lower their ratio could choose to reduce their prices in order to lower their tax burden, thus increasing their profit after tax. They could more easily increase profits by reducing their prices than in our current system. No matter which way you look at it, this policy will distribute the gains in automation back into the middle class. Would retailers, like Walmart, prefer to import goods from countries without these labor policies? An overseas manufacturer paying poverty wages will surely be able to offer lower prices to our retailers than manufacturing companies here in America. American manufacturers would need protections from these forms of trade that destroy these kinds of industries. We already do this in some ways. We tax imports. So, we’d have to raise import taxes. We could make trade deals with countries that use these same business tax variables. Ideally, if every government worldwide entered into a global economic trade agreement to employ this tax policy it would eliminate all tariffs and would replace the need for any other current trade agreement. It could be called the Labor Protection from Automation and Exploitation Global Trade Agreement. Would companies want to move overseas to avoid these corporate taxes? Yes, naturally, but we offer incentive to stay by increasing importation taxes. If they moved they would lose the business of the American consumers or pay importation taxes so high that it would be more profitable to stay. If they go, let them go. New companies will form that produce the domestic jobs we need. With these policies, the American consumer will be more powerful than ever, and every company will want to do business in America. What happens when there is full employment and companies can’t get into the lower corporate tax bracket because there are no people left to hire? They can still increase wages, or they can lower prices to reduce profit. They can even pay the immigration fees for people to move to the US for work. They might even offer better work environments or amenities to recruit workers from other companies. In our current economy innovation hasn’t been progressing as quickly as predicted. It’s because of rising income inequality, stagnating middle class wages, and declining workforce participation. With a depleting middle class, there isn’t a strong enough consumer base to demand investments in more highly automated technology. Automation marginally suppresses automation without some way of redistributing the gains in productivity back to the middle class. It may seem counter to productivity to tax highly productive companies with low labor costs and high profits, but it will actually result in higher production and innovation across the whole economy. Currently, too much wealth is stagnating unable to be invested into innovation for middle class consumers. This policy primarily prevents the hoarding of the gains that come from automation. Many people who strike it rich sit on their money and stop innovating or giving back. Something else that occurs in our current economy is companies that automate first reap large profits before competitors catch up. Every time this happens a little more wealth is accrued for a few select millionaires or fewer jobs or raises are available for the middle class. The companies that don’t automate first put pressure on their employees to catch up, working longer, harder, and without raises. Sometimes, those companies that automate first drastically temporarily lower retail prices so they can snuff out competitors and then monopolize the industry. Then, an industry without enough competition loses some of their motivation to be more productive, innovate, or offer competitive prices. Highly automated companies create huge barriers to entry for new businesses, thus further stagnating innovation. This kind of robot tax will empower the consumer class allowing stagnant wealth to be put to use towards innovation, robots, and productivity. Also, consider how much of productivity increases and innovation comes from employees. When employees fear losing their job to automation they stop innovating. There is no incentive to saving a company time or money if it only translates into higher profits or lower prices, not higher wages or job security. Securing labor with the P/L ratio will empower employees to innovate. As more middle class people are able to grow their saving they’ll be able to branch off and open their own businesses, innovating in ways the current economy didn’t promote. This policy greatly promotes innovation in numerous ways. How will this affect independent contractors or companies that hire large contractors? This policy will produce an economy that should allow any business that currently employs independent contractors to be able to afford to classify them as employees instead. With economy-wide wage increases, and no price inflation, those industries that require the use of independent contractors will be able to charge a slightly higher price to afford better compensation. Just in case, perhaps we could allow some form of independent contractor tax filing status to be part of this tax reform. Companies that employ independent contractors would likely have a very low P/L ratio; they’d benefit from the robot tax. For the record, I owned a business that employed mostly independent contractors. I know all too well that those jobs in the delivery business will soon be outsourced to drones and self-driving cars. Independent contractors by definition use their own equipment, but it is the equipment that will soon be displacing their jobs. Independent contractors will become less common regardless of my robot tax. As for larger contractors, businesses that use large contractors will still be able to deduct expenses as normal. Some businesses will decide to employee people themselves instead of using contractors, which for workers just means a new employer. Some businesses with a low P/L that uses contractors will still find it more profitable and efficient to use contractors. Some large contractors will be bought out by the companies that they receive contractors from. Some contractors won’t like this policy, but the important part is that the jobs will still remain in the economy. With all the other positive effects of my robot tax, those jobs will be higher paid and more abundant too. How do your purchases affect employment?